I thought I had better things to do than update MILcentric for a few months, but now it’s back! There are 6 new posts up since the hiatus. I know a lot of you guys have no interest in menswear / fashion, but I do and it consumes a lot of my thoughts, money, and time. Regardless of whether you share the same passion, you might find what I write in the posts worth a laugh or two. Go check it out and even subscribe to the mailing list in the top right corner for updates! Well if you want to ask a girl out on a date I think you win, unless she’s into X-wings. Speaking of fashion when are you going to start selling t-shirts to Canuks again? Good call! Nick Wooster x Tactical Tailor x Costa Lupus would be the move too. Definitely a next level satchel of some type would be birthed, with lots of compartments for tactical arm tape. I think a lot of the stuff there is cool and a lot of it is kind of weird. I’d definitely wear some of it, but alas, the price tags are for Mitt Romneys. Agreed. Most of the stuff I post about is on the higher end of the spectrum (in price anyway). I looked at it occasionally back when you were updating it. It’s interesting, but the price points are usually well into ludicrous range for me, but I’m a jeans and t-shirts or shorts and flip-flops kinda guy. That tote is pretty sweet though. No doubt Matt. I think most people come for my attempt at witty commentary…. kind of like ENDO. 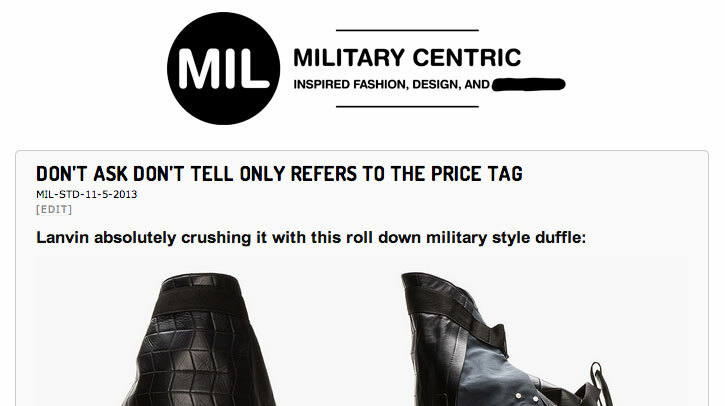 Wondered what happened… I check MIL every so often for a quick laugh at some of the tacti-camo-cool clothes. You do post some vids and stuff that don’t get on ENDO, that are pretty good.